Technological change is reshaping political communication all over the world. This is especially true when it comes to communicating political issues with young people, and political organizations ignore these new developments at their peril. This insight has prompted the Young Liberals and Democrats of Asia (YLDA), with the support of the Friedrich Naumann Foundation (FNF), to organize a workshop on information and communication technology (ICT) for its member organizations. It was hosted by the Youth Wing of Party Gerakan in Penang, Malaysia from 17 – 22 May 2007. The workshop concentrated on introducing the participants to the techniques of blogging and podcasting. Philippine Über-Blogger Abe Olandres first gave a concise overview of the editorial, technical and ethical issues. 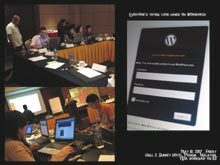 He then made everybody sweat: each participant had to set up his or her own blog. The results were presented and analysed by Abe and the other participants. As a result, the blogosphere has gained a gaggle of new entrants – and hopefully some will stay and enrich public discourse or convince others to start to participate. Podcasting was next, and this was done by group work. Abe explained the potential of it. He also discussed the many technical support Websites available that have made it possible to produce audio programs of good quality. The workshop also evaluated the Websites of YLDA members and discussed the usefulness of the Internet for fundraising. The Web is an area of great possibility as shown by Howard Dean‘s campaign for the 2004 Democratic presidential nomination in the US. He emerged as an early front-runner due in part to his building a Web-based constituency and mobilizing a massive amount of small donations via the Internet. The ICT workshop underlined the potential of these new techniques for political communication. “Since young people are the ones who plug into these new technologies the most avidly, youth wings are well advised to offer interesting content for them in order to stay in touch,” FNF Resident Representative Siegfried Herzog, who participated in the workshop as a resource person, stressed. “The experience of South Korea is certainly instructive. A cyber-savy campaign mobilized the youth vote to an unprecedented degree, delivering victory for President ROH, Moo-hyun,” he added. "Some of the countries in the region might not have gone very far yet in terms of Internet usage, but the growth rates point to an unmistakeable conclusion: it’s going to happen here soon, so you’d better be prepared,” he concluded.